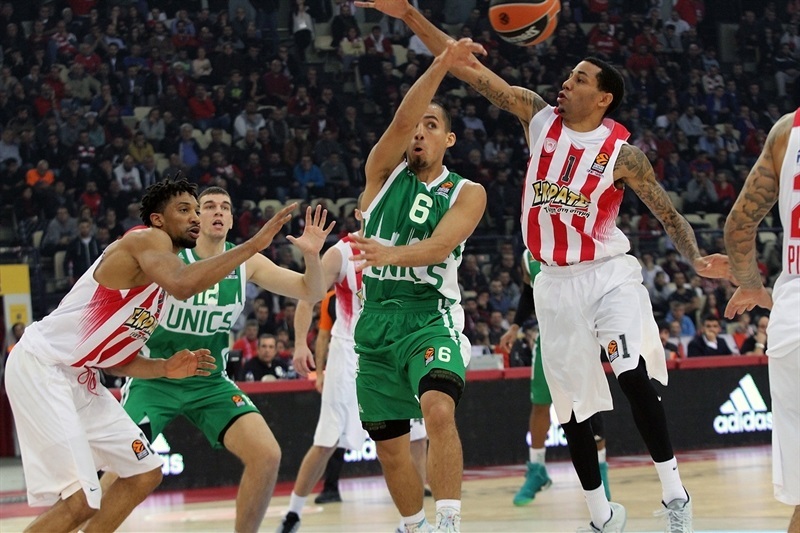 Olympiacos Piraeus led from start to finish, thrashing visiting Unics Kazan 88-59 at Peace and Friendship Stadium on Friday. 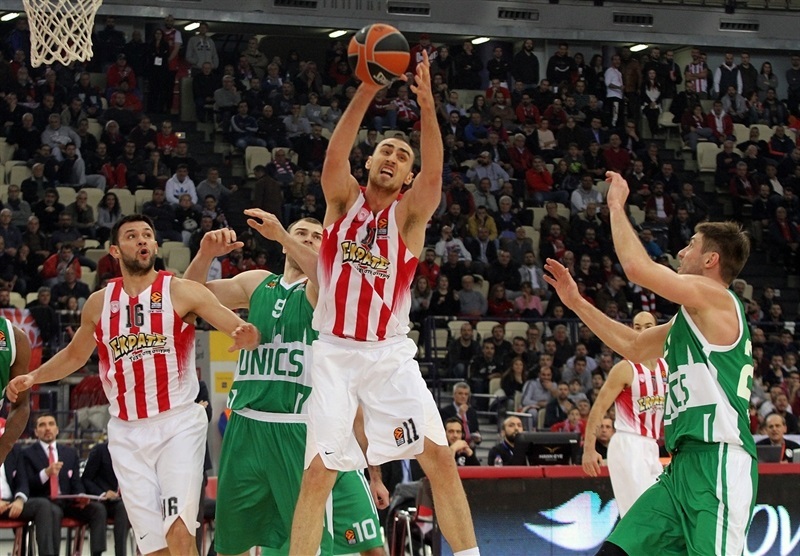 Olympiacos improved to a 7-4 record, while Unics dropped to 3-8, tied for the last place in the standings. 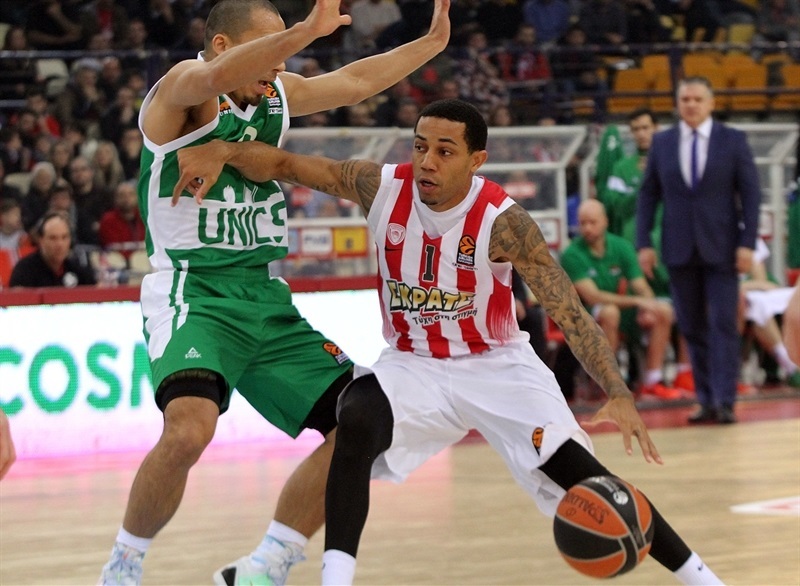 An Olympiacos win was never in doubt, as it controlled things from the get-go behind its defense. 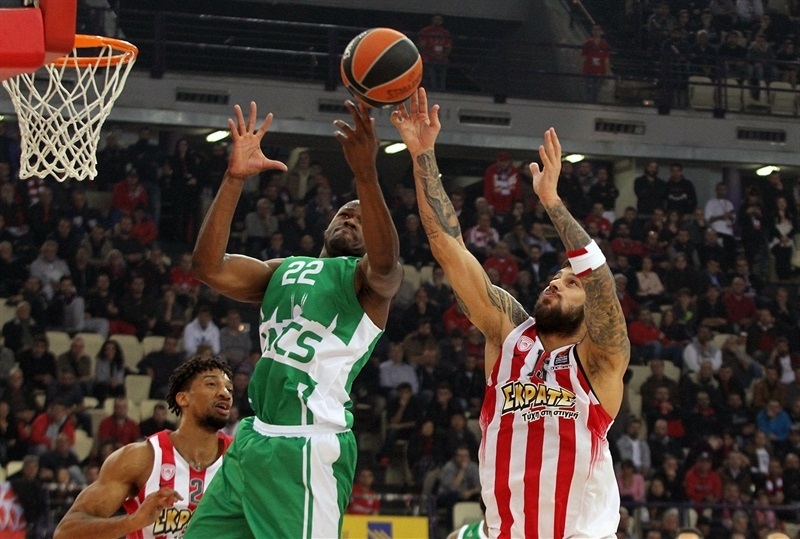 It’s the biggest win of the season for Olympiacos, and the second time this season that its defense allowed fewer than 60 points. Matt Lojeski had 15 points and 6 rebounds while Erick Green also scored 15 in victory. 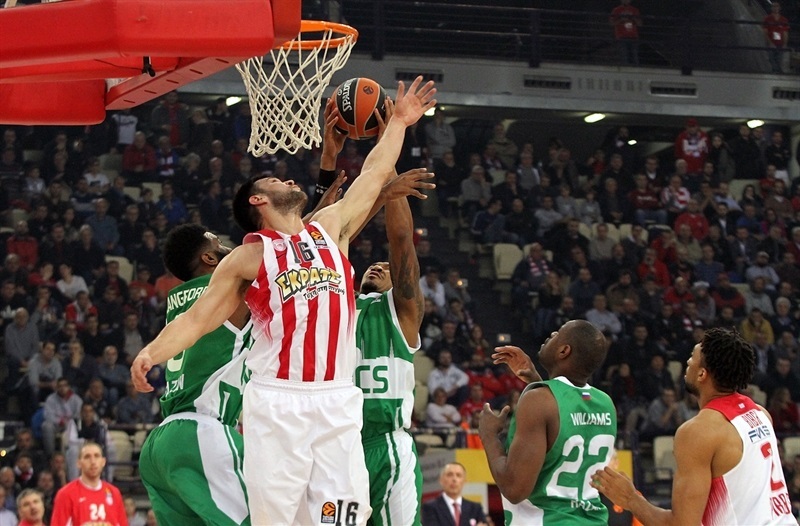 Kostas Papanikolaou had 12, Georgios Printezis 11, and Vassilis Spanoulis 10 in less than 17 minutes on the floor. 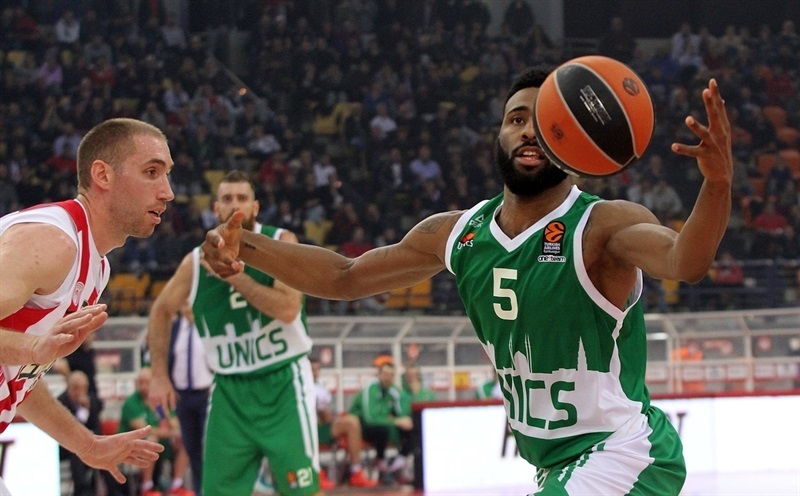 For Unics, Keith Langford scored 13 of his 25 points in the final 6 minutes, and Latavious Williams scored 9 in a losing effort. 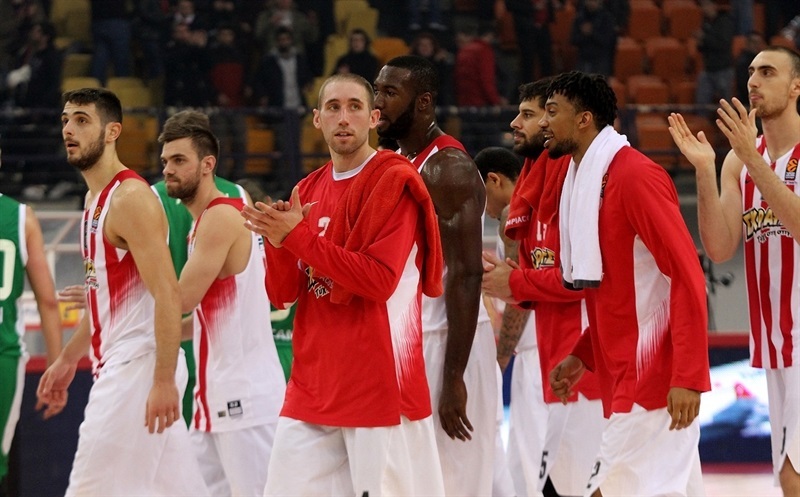 Olympiacos started building lead from the start behind its defense, while on offense Printezis hit a triple and a baseline floater that opened 13-2 advantage. Langford scored the first 7 points for the visitors, but Spanoulis and Printezis made close-range baskets that opened 19-7 lead. 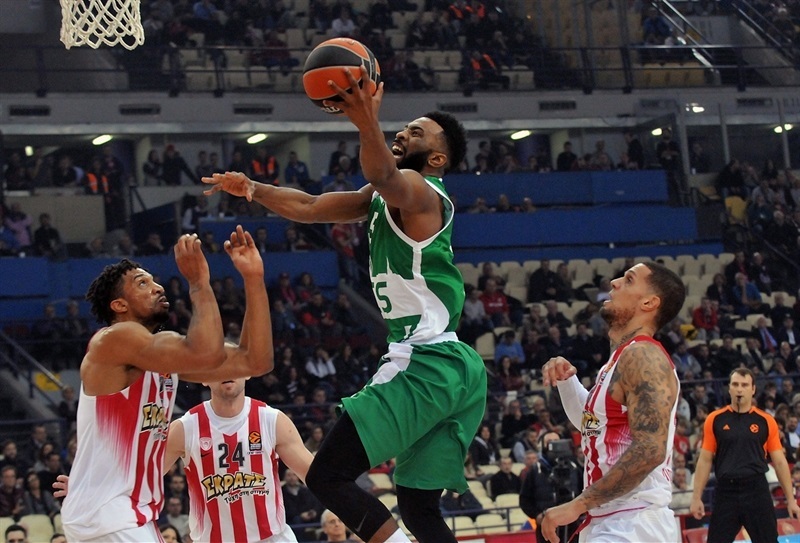 Lojeski and Williams traded three-point plays, but Langford needed only 9 minutes to be the first players in double figures, keeping Unics in range. The hosts lead 24-16 at the end of first, and Paul Stoll helped the visitors get within 4 points at the start of the second. 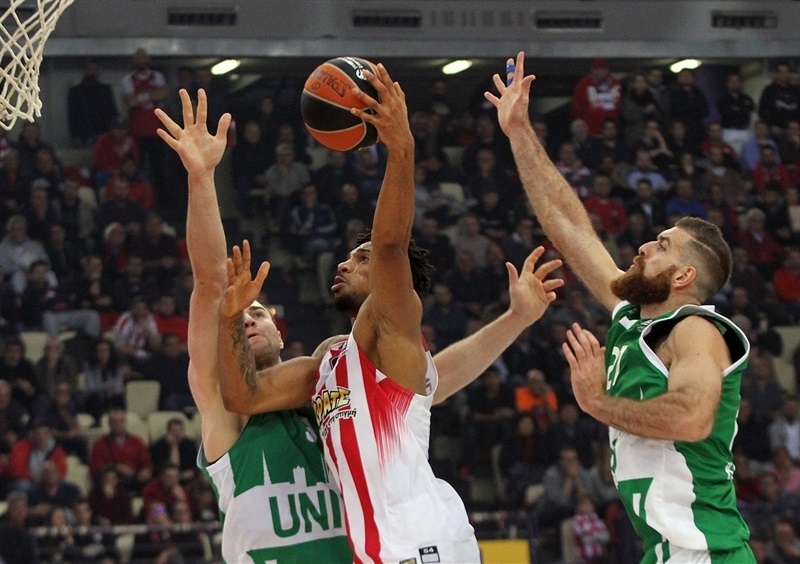 But Olympiacos turned back to its defense, keeping Unics scoreless for almost 5 minutes and restoring double-digit margin with help from hustle plays by Khem Birch and Lojeski. Birch had a three-point play near the end of a 13-2 run, before Green made a long baseline jumper in transition to make it 41-24. The hosts went into the break ahead 43-28, then opened the third quarter with a 11-2 run in a matter of 2 minutes and 7 seconds when Vangelis Mantzaris nailed a triple that made it 54-30. The Reds never looked back and broke the 30-point barrier in the opening minute of the fourth, 73-43. 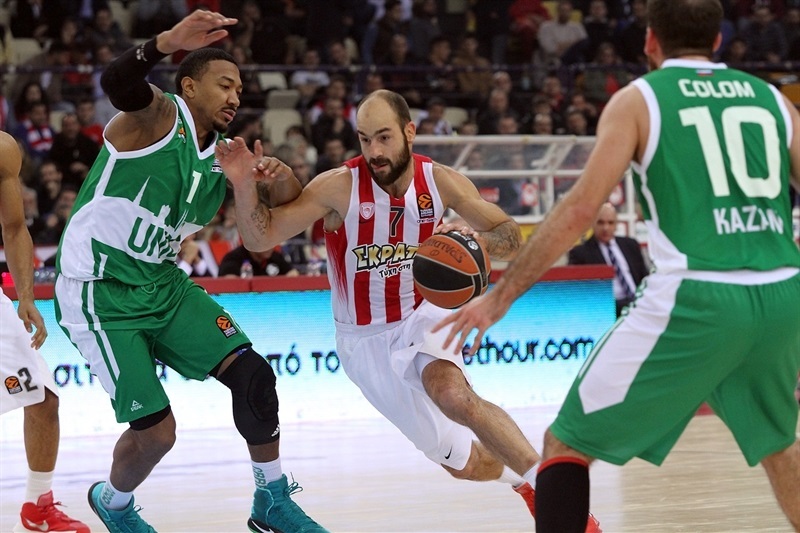 Olympiacos lead was as large as 80-45, as it cruised to victory. "We had a very good defensive game. 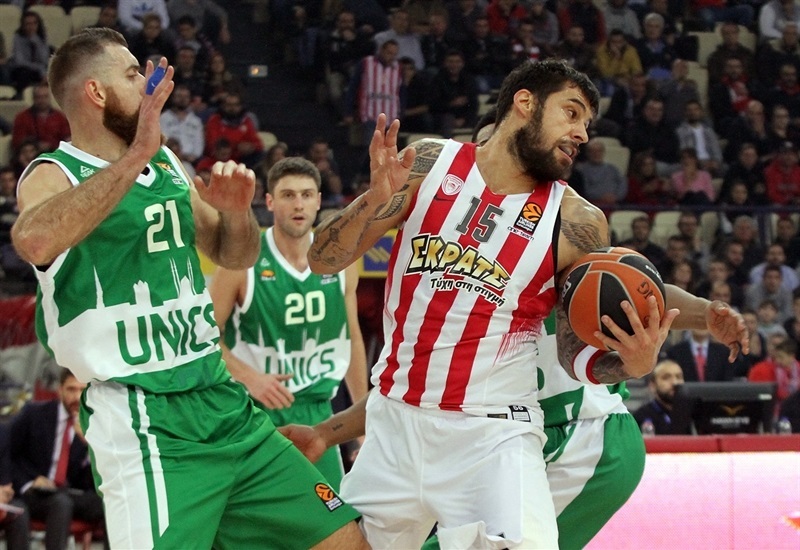 We were very focused to break Unics's production and scoring. I think we had one of our best defensive games. 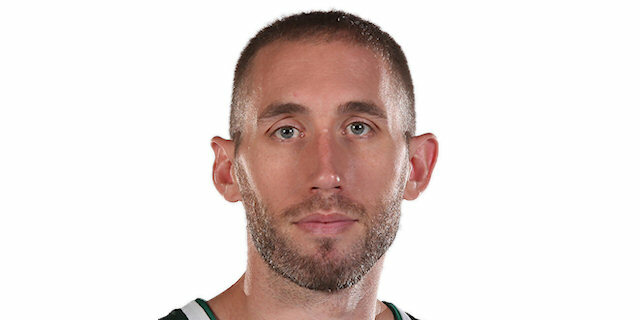 We kept Keith Langford in low scoring, although he scored 25 points, he only had 11 after 30 minutes, all of which he scored in the first quarter. He scored some points at the end of game, when the outcome was clear. And it is very important he did not have any assist. We did a really good job against Quino Colom, who is a very important player for them. Another big player for them, Artsiom Parakhouski, was out of the game due to our defense. Good individual defense, but also adjustments of team defense. Finally, a game that was difficult in the beginning looked so easy at the end. But it was not an easy game, our players made it look easy, because except good defense we also had good offense. We had a great team game, shared the ball good, moved the ball and found open shots. We had five scorers in double digits. In general, we had an opportunity to use all players and everybody responded really well. But we have to forget this game and focus on the next one. I want to thank our fans who supported us. Daniel Hackett will be out for a long period. 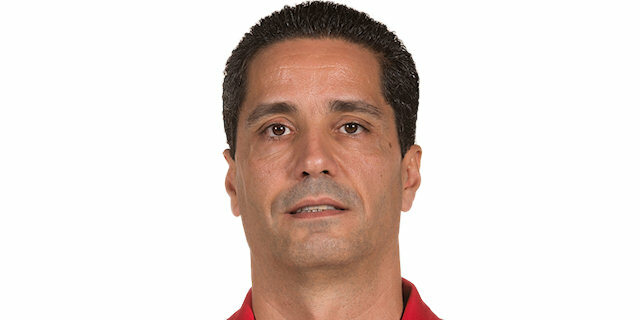 I wish Unics good luck." "What to say after a game like this? We were better on defense than on offense. We did not show our best on offense. And most important is we did not show heart. If you play without heart, and don’t be a man, it does not matter if you score or not, but if do not fight, it is my responsibility. We have a big, big problem. It is not about tactics, Olympiacos was better than us today and they deserved to win but we did not show pride or character. Nothing." "We played good defense from the beginning of the game. Everybody who came in, helped us. From good defense we had good offense. We played good defense on Langford in the first half especially. He took a lot of shots to get some points. We were focused on him to make it hard for him, and were focused on offense after that."